All reviews and site design © by Thomas M. Wagner. Wink the Astrokitty drawn by Matt Olson. All rights reserved. Book cover artwork is copyrighted by its respective artist and/or publisher. “Post-apocalyptic fiction” means a very different thing in the early 21st century than it did in the 20th — as does “young adult fiction,” for that matter. Back when our calendar years began with a one and a nine, post-apocalypse usually meant post-nuclear war. A decade into the new century, and we’re now worried about cataclysmic climate change, our failed stewardship of our dear Mother Earth. In Jo Treggiari’s grim adventure Ashes, Ashes, Mother Earth is pissed, and has decided to give us a time out once and for all. First comes the horrifically mutated new smallpox strain, that leaves only one person in a million alive (though how a bacillus can be so mathematically OCD is a matter left for speculation). Then you got your earthquakes, you got your floods and melting ice caps, storms, lions and tigers and bears, oh my! There’s plenty about this book to admire. I mean, it’s not The Road or anything. But Treggiari actually builds a far more convincing dystopian future than Suzanne Collins, whose Hunger Games trilogy has spawned a growth spurt of teenpocalypse fiction on the YA shelves. However, Treggiari makes a smattering of unfortunate storytelling choices that, like Collins’ work, prevent me from embracing it as fully as the fans might. And there’s one thematic choice that irritated me in particular. Still, I’ll freely admit you’ll find deftly executed suspense and action here. Sixteen-year-old Lucy is just old enough to remember the last few years of a normal world. When everything went to hell in a handbasket, it did so at breakneck speed. Now she ekes out an existence in the remains of Central Park, and Treggiari spares her (and us) nothing in the way of hardships. The entire first chapter is given over to an exhaustive account of Lucy’s attempts to kill and stew a turtle, followed by a round of being chased by a pack of vicious dogs. We get the impression it’s an average day. In these conditions she will be lucky to make it to nineteen. If I had to live the desperate hunter/gatherer life that has been forced upon Lucy, I’d probably just find a nice tree to sit under, and not take long to decide there was no point in getting up again. This being a young adult adventure, Lucy inevitably meets a boy, Aidan. Abandoning her solitary camp after it’s washed away by a tsunami, because you can outrun those if you really try, Lucy ends up in Aidan’s ramshackle refugee camp. It’s populated by some teens, some little kids, and a handful of bedraggled adults, whose age bracket suffered the most thorough fatalities during the plague. After the required romantic tension thing is established between Lucy, Aidan, and rival girl Del, Lucy quickly discovers that the lives of the survivors are routinely disturbed by the staff of a nearby hospital. This fortress of doom is run by one Dr. Lessing, who sends white vans full of hazmat-suited thugs, the Sweepers, out to the camp to taser everyone and abscond with small children and the elderly, who are Never Seen Again. It is presumed devilish things are done to them while strapped to gurneys, either involving knives and needles, or Justin Bieber videos. It wasn’t just that I couldn’t help wondering why Aidan’s people didn't just pack up their junk and move several miles away (a bigger survivor community to the north is mentioned more than once), rather than staying put at the end of one of the few roads that hasn’t been entirely torn up by seismic activity, and which happens to have the evil hospital at the other end. It was that here we have an SF novel about the near-demise of the human race and the Earth’s environment, and the one character who is offered as an arch-villain happens to be the (presumably) only scientist still alive and working to find a cure to the still-mutating plague. I mean — wha? I never cease to be amazed that we are living well into the 21st century, and American culture, having enjoyed the benefits of modern science for more than a century, is now being overtaken by what can be fairly described as anti-science madness. From public rejection of evolution and climate change research; from our baffling refusal to reduce our dependence on vanishing fossil fuels and embrace renewable energy; from an utterly appalling anti-vaccination hysteria, promulgated by fraudulent research and promoted by vapid celebrities, that has seen the resurgence of such afflictions as whooping cough and measles — more and more, a scientifically illiterate public are being duped by a wave of science-is-the-enemy propaganda. 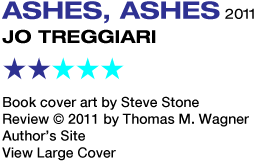 Ashes, Ashes, whether Treggiari means it to or not, lets itself become part of the problem. Sure, Treggiari commendably distances herself from the anti-vaxxers, at least, making the point clear that among the unvaccinated, the plague claimed a 100% mortality rate. But then Lucy, we learn, is somehow special, never vaccinated and never infected, and Dr. Lessing wants her blood for this very reason, so that it can perhaps be used to synthesize a vaccine. Now, to me, that sounds like a great plan, even, dare I say it, a heroic one. But Treggiari, for whatever reason, decides that Dr. Lessing has to go about her business all Cruella de Frankenstein. Lucy experiences a brief moment of inner conflict, realizing, after all, that while Dr. Lessing may be kidnapping people and sending out packs of ravenous rottweilers to hunt Lucy down, she is trying to save the world. But any moral ambiguity is quickly disposed of once Treggiari just has Dr. Lessing go full metal psycho, and everything’s resolved in a series of chase and fight scenes. Science fiction ought to act as a counter to the public’s irrational fears of science, illuminating and not demonizing it, celebrating its use as the tool of humanity’s progress. Science itself is neither good nor evil, it is simply a method. When its results do harm, it’s at the hands of bad people using it to satisfy personal or political agendas. But Dr. Lessing is evil in the shallowest, most one-dimensional way. No good reason is given in the story for why she’s so nefarious. There is no depth to her character that might have explained what made her so twisted in pursuit of a goal that should be altruistic in the extreme, which might have been really interesting. Nope. She’s just The Villain, because a story’s gotta have one. 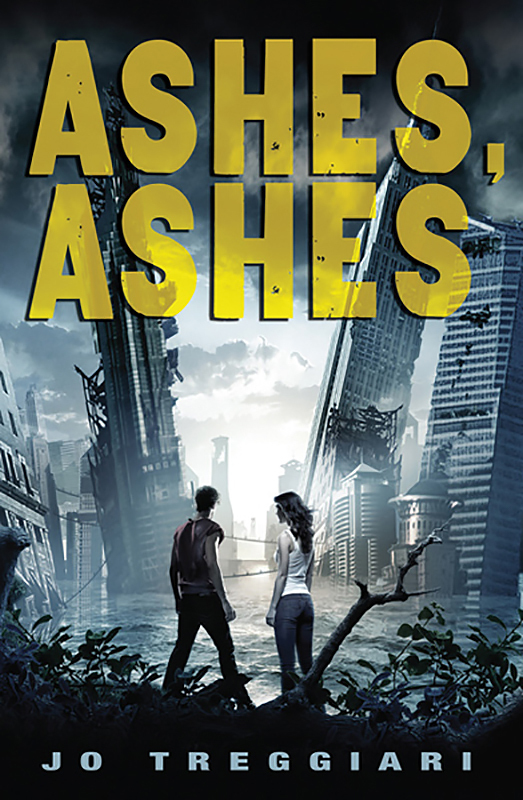 While Treggiari offers likable heroes, and can write some gripping and suspenseful action, by leaving her young readers with a message they really don’t need to hear — “Scientists are crazy and they want to kill you” — in the end, Ashes, Ashes all falls down.